MOYNTAGHS, or ARDMORE, a parish, in the barony of ONEILLAND EAST, county of ARMAGH, and province of ULSTER, 4 miles (N. W.) from Lurgan, on the road to Stewartstown, by way of the Bannfoot ferry; containing 2891 inhabitants. This parish is situated on the southern shore of Lough Neagh, and is bounded on the south-west by the river Bann; it comprises, according to the Ordnance survey (including islands), 18,098 1/4 statute acres, of which 12,178 are in Lough Neagh, 305 1/2 in Lough Gullion, and 83 in the Bann. About one-half of the land is arable, and the remainder bog, which C. Brownlow, Esq., has attempted to drain and reclaim. For this purpose he erected a windmill, which was soon destroyed by a storm, and was replaced by a steam-engine, which proved ineffectual. An extensive embankment was formed across Lough Gullion, and the steam-engine long employed in draining it; but all these efforts were defeated, as the water seemed to return by subterranean springs. Agricultural pursuits, fishing, weaving linen, and working the turf bog, are the principal employments of the inhabitants. Raughlin, the seat of J. Forde, Esq., is surrounded by plantations, gardens, and pleasure-grounds of a luxuriant character, and commands splendid views of the lake and the counties of Tyrone, Derry, Antrim, Down, and Armagh: in the lake is an island, beautifully planted with fruit-trees and evergreens, the whole forming a beautiful spot in the midst of a boggy and unproductive tract. On the opposite shore is the glebe-house, the residence of the Rev. D. W. Macmullen. Moyntaghs was formerly part of the parish of Seagoe, but in 1765 it was erected into a separate parish. By charter of James I., the rectory was made one of the five parishes constituting the union of Donaghclony and corps of the archdeaconry of the diocese of Dromore, to which it remained united until 1832, when, by act of council, the union was dissolved, and it was united and consolidated with the vicarage, and the living is now a rectory and vicarage, in the diocese of Dromore, and in the patronage of the Bishop. The tithes amount to £54. 2. 6., besides which, the Ecclesiastical Commissioners grant £71. 2. out of Primate Boulter's fund. The glebe-house was erected by aid of a gift of £415. 7. 8 1/2., and a loan of £55. 7. 8 1/4 ., British currency, from the late Board of First Fruits, in 1820; the glebe comprises 13 acres, valued at £16. 5. per annum. A small church was built in 1765, close to the shore of Lough Neagh, but it was blown down in a storm on Nov. 4th, 1783; after which accident the new one was built, in 1785, on a more eligible site; its elevated situation and tapering spire, render it an interesting object when viewed from the lake or any of the neighbouring shores: the late Board gave £276. 18. 5 1/2., British currency, towards its erection. 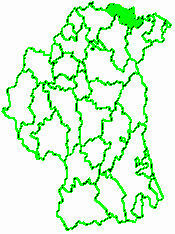 In the R. C. divisions the parish forms part of the union or district of Seagoe. About 60 children are educated in the parochial school, which is principally supported by the incumbent; the school-house is large and commodious. There are also three private schools, in which are about 130 children, and a Sunday school. C. Brown-low, Esq., the proprietor of the parish, built a village near the Bannfoot ferry, naming it Charlestown; he obtained a patent for a fair on the first Monday in every month, but it has not yet succeeded. This village is seven miles from Lurgan, Portadown, and Stewartstown, being intentionally equidistant from each of these towns.